In this article, we are dealing with the trends in the post-Mauryan art and architecture as a part of the Indian Culture series based on the NCERT textbook ‘An Introduction to Indian Art’- Part 1. We have already discussed the arts of the Mauryan period in the previous article. This post gives a detailed description about the Post-Mauryan Schools of Art and Architecture such as Gandhara, Mathura, Amaravati, etc. and also the cave traditions that existed during the period. This post also deals with some of the important architectural sites such as Sanchi, Ajanta, Ellora, etc. Take the Clear IAS Exam UPSC prelims mock test on Indian culture. You not only will learn the important facts related to Indian culture, but will also start to love the subject! From the second century BCE onwards, various rulers established their control over the vast Mauryan Empire: the Shungas, Kanvas, Kushanas and Guptas in the north and parts of central India; the Satavahanas, Ikshavakus, Abhiras, Vatakas in southern and western India. The period also marked the rise of the main Brahmanical sects such as the Vaishnavas and Shaivas. Some of the finest sculptures of this period are found at Vidisha, Barhut (M.P), Bodhgaya (Bihar), Jaggaypetta (Andhra Pradesh), Mathura (UP), Khandagiri-Udayagiri (Odisha), Bhaja near Pune (Maharashtra). Barhut sculptures are tall like the images of Yaksha and Yakshini in the Mauryan period. Modelling of the sculpture volume is in low relief maintaining linearity. Relief panels are depicted by narratives and clarity in the narratives are enhanced by selecting main events. Narrative panels are shown with fewer characters, but as the time progress, apart from the main character in the story, others have also started appearing in the picture space. Availability of space is utilized to the maximum by the sculptors. Narrative reliefs at Barhut show how artisans used the pictorial language very effectively to communicate stories. One such narrative shows Queen Mahamaya/Mayadevi’s (mother of Siddhartha Gautama) dream. The queen is reclining on the bed, whereas an elephant is shown on the top heading towards the womb of the queen Mayadevi. On the other hand, the depiction of a Jataka story is very simple – narrated by clubbing the events according to the geographical location of the story like the depiction of Ruru Jataka where the Bodhisattva deer rescuing a man on his back. Such Jataka stories became part of stupa decoration. With the rise in the construction of stupas in various parts of the country, regional stylistic variations also began to emerge. The next phase of cultural development at Sanchi stupa-1, Mathura and Vengi in Andhra Pradesh is noteworthy in the stylistic progression. Stupa-1 at Sanchi has upper as well as lower pradakshinaptha or circumambulatory path. It has four beautifully decorated Torans (Gateways) depicting various events from the life of Buddha and Jataka stories. Figure compositions are high in relief, filling up the entire space. The depiction of posture gets naturalistic and there is no stiffness in the body. The narration gets elaborated and carving techniques appear more advanced than Barhut. Symbols continued to be representing Buddhas or past Buddhas (according to the textual tradition there are 24 Buddhas, but only first one, Dipankar, and the last six are pictorially represented). Even though narrative gets more elaborated, the depiction of the dream episodes remains very simple (the dream of queen Mayadevi). Sanchi near Bhopal, Madhya Pradesh, is a World Heritage Site. Along with other relatively small stupas, there are three main stupas. Stupa-1 is presumed to have the relics of the Buddha. Stupa-2, the relics of ten less famous Arhats belonging to three different generations (In Theravada Buddhism, an Arhat is a perfected person who has attained Nirvana. In other Buddhist traditions, the term is used for people far advanced along the path of Enlightenment, but who may not reach full Buddhishood). Stupa-3 has the relics of Sariputta and Mahamoggallana/Mahamougalayana (disciples of Gautama Buddha). Stupa-1 is the finest example of stupa architecture and is known for the carvings on its gateways (torans). Originally it was a small brick structure which expanded over a period and was covered with stone, vedika (fence) and the torans. There is also the upper pradakshinapatha which is unique to this site (i.e., totally two pradakshinapathas). The four gateways are decorated profusely with sculptures. Torans are constructed in all four directions. Their stylistic differences indicate their possible chronology from the first century BCE onwards. 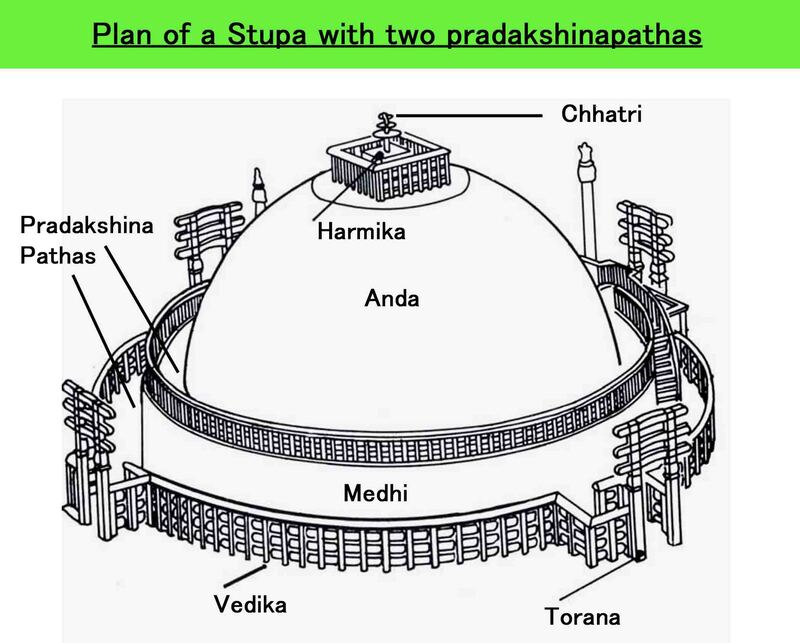 Though stupa-1 is the oldest stupa, the carvings of images at the vedika of stupa-2 are earlier than those on stupa-1. Jataka stories also became an important part of the narratives. 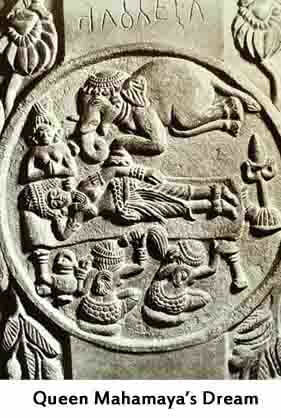 The figures in Sanchi despite being small in dimension are very naturalistic. There are guardian images on sculptors and salabhanjika sculptures are remarkable in their volume (salabhanjika are sculpture of ladies holding the branch of a tree/plate etc). Each torana consists of two vertical pillars and three horizontal bars on the top. Each horizontal bar is decorated with different sculptural themes on both sides. Supporting the extension of the lowermost horizontal bar from below are the images of salabhanjikas. In the first century CE onwards, Gandhara (now in Pakistan), Mathura in UP and Vengi in Andhra Pradesh emerged as important centres of art. The sculptural tradition in Gandhara had the confluence of Bactria, Parthia (both were Indo-Greeks) and the local Gandhara tradition. The local sculptural tradition of Mathura became so strong that the tradition spread to other parts of northern India. The best example is the stupa sculpture found at Sanghol in the Punjab. The Buddha image at Mathura is modelled on the lines of earlier Yaksha images, whereas in Gandhara it has Hellenistic features. [Hellenistic art is the art of the Classical period dating from the death of Alexander the Great in 323 BCE to the emergence of ancient Rome]. Images of Vaishnava and Shaiva faiths are also found at Mathura, but Buddhist images are found in large numbers. The images of Vishnu and Shiva are represented with their Ayudhas (weapons). Characteristics of the different architectural schools are explained below with a suitable example from each. A large number of images dating back to the Kushan period are from Mathura. The image of Buddha from Karta Mount belongs to the second century CE. It represents the Buddha with two Boddhisattva attendants. 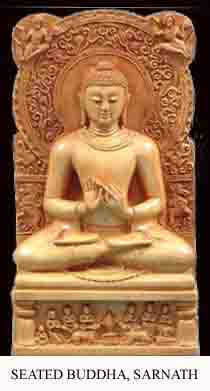 The Buddha is seated in Padmasana and the right hand is in the Abhayamudra. The face of the Buddha is round with fleshy cheeks. The Ushanisha (hair knot) is shown with a vertical raised projection. Mathura sculptures from this period are made with light volume having a fleshy body. The sanghati (garment) covers only one shoulder. The attendant figures are identified as the images of Padmapani and Vajrapani Bodhisattvas as one hold lotus and the other a Vajra (Thunderbolt). The halo around the head of Buddha is very large and is decorated with simple geometric motifs. There are two flying figures placed diagonally above the halo. 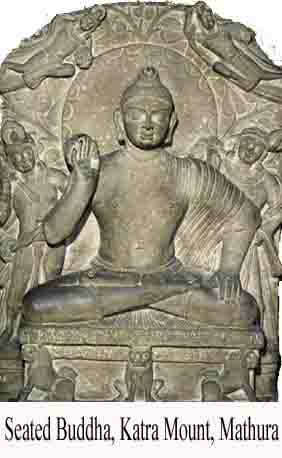 The image of Buddha from Sarnath made of chunar sandstone belongs to the late fifth century CE. The Buddha is shown seated on a throne in Padmasana. It represents Dhammachakrapravartana (first sermon) as can be seen from the figures on the throne. The panel below the throne depicts a Chakra (wheel) in the centre and a deer on either side with his disciples. Thus, it is the representation of the historic event of Dhammachakrapravartana or the preaching of dhamma. It is the finest example of Sarnath School of sculpture. 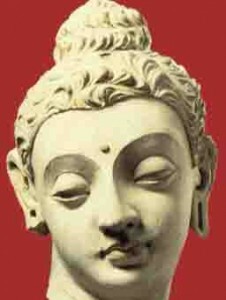 The face is round, the eyes are half closed, the lower lip is protruding, and the roundness of cheeks has reduced as compared to the earlier images from the Kushana period at Mathura. The hands are shown in Dhammachakrapravartana Mudra. The Ushanisha has circular curled hairs. The aim of the sculptures in ancient India had always been to represent the Buddha as a great human being who achieved Nibbana (cessation of anger and hate). The Buddha head from Taxila in the Gandhara region, now in Pakistan, dates back to the second century CE and belongs to the Kushanas period. It shows the hybridized pictorial convention that developed during the Gandhara period. The Buddha Head has typical Hellenistic elements. The curly hair of Buddha is thick having a covered layer of shape and linear strokes over the head. The forehead plane is large having protruding eyeballs, eyes are half closed and the face and cheeks are NOT round like the images of other parts of India. There is a certain amount of heaviness in the figures of Gandhara region. The ears are elongated, especially the ear lobes. The treatment of the form bears linearity and the outlines are sharp. The surface is smooth and the image is very expressive. The expression of calmness is the centre point of attraction. Modelling of face enhances the naturalism and three-dimensionality. Assimilating various traits of Acamenian, Parthian and Bactrian tradition into the local tradition is a hallmark of Gandhara style. The source of development of Buddha images as well as other has its genesis in its peculiar geopolitical conditions. It may also be observed that the north-western part of India, which is now in Pakistan, always had continuous habitation from proto-historic times. It continued in the historic period as well. Vengi in Andhra Pradesh has many stupas like Jagayyapetta, Amaravati, Bahattiprolu, Nagarjunakonda, etc. Amaravati has a Mahachaitya and had many sculptures. Like Sanchi stupa, Amaravati stupa also has pradakshinapatha enclosed within a vedika on which many narrative sculptures are depicted. The domical stupa structure is covered with relief stupa sculpture slab which is a unique feature. The torana of the Amaravati stupa has disappeared over a period of time. Like Sanchi, the early phase is devoid of Buddha images but during the later phase (2nd and 3rd CE); the Buddha images are carved on the drum slabs and at many other places. The sculptural form in this area is characterized by intense emotions. Bodies are shown with three bends (Tribanga), and the sculpture composition is more complex than Sanchi. The Dream of Queen Mayadevi has also been depicted here. Independent Buddha images are also found at Amaravati, Nagarjunakonda and Guntapalle. Guntapalle is a rock cut cave near Eluru, Andhra Pradesh. In Karnataka, Sannati is the largest stupa excavated yet. Along with the images of Buddha, other Buddhist images of Bodisattvas like Avalokiteswara, Padmapani, Vajrapani, Amitabha, and Maitreya Buddha started getting sculpted. Hellenistic art, Greeko-Roman elements along with traditional elements. Rich carving and great symbolism. Highly polished and rich carvings. Curly hair and elongated ears. Initially made of stone and later stucco used. Indigenous in the beginning but later influenced by Gandhara. Not much refined compared to Gandhara. Mostly made of red sand stone. Most of the works are on marbles. Buddha mostly represented by symbols. Beauty is less when compared to Gandhara and Mathura. In the western India, many Buddhist caves dating back to the second century BCE onwards have been excavated. In all the chaitya caves, a stupa at the back is common. In the first century BCE, some modifications were made to the standard plan of the apsidal vault-roof variety where the hall becomes rectangular with a stone screen wall as facade. The biggest rock cur chaitya hall was excavated in Karla, Maharashtra. Viharas are excavated in all the caves. The plan of vihara consists of a veranda, a hall and cells around the walls of the hall. Many of the early vihara caves are carved with interior decorative motifs like chaitya arches and the vedika designs over the cell doors of the cave. A stupa was added in the back of the vihara in the later period and it became Chaitya- Vihara. Junnar (Maharashtra) has the largest cave excavations – more than 200 caves around the hills of the town – whereas Kanheri in Mumbai has a hundred and eight excavated caves. Vihara cave excavated at Junnar is popularly known as Ganeshi because of an image of Ganesh belonging to a later period was installed in it. Earlier it was believed that because of the absence of the Buddha images, the caves were considered belonging to the orthodox faith of Buddhism, Theravadins. But with the discovery of Konkan Maurya inscription mentioning the Saka era 322 (400CE), it is now satisfactorily proved that the caves activity in western Deccan was an ongoing process and many caves had been carved with Buddha image where the image does not exist anymore. It may also be noted that many caves are converted into modern Hindu shrines and have become popular worship sites. The famous cave site in western India is Ajanta. It is located in Aurangabad district of Maharashtra. It has 29 caves, including 4 chaitya caves. It has the large Chaitya-Vihara and is decorated with sculpture and paintings (murals). Ajanta is the only surviving example of the painting of the first century BCE and the fifth century BCE. Some of the vihara caves here are unfinished. The important patrons of Ajanta were Varahadeva, the Prime Minister of Vakataka king Harisena; Upendragupta, the local king of the region and feudatory of Harisena; Buddhabadra and Mathurasena. Major paintings are in cave Nos. 1, 2, 16 and 17. The paintings have a lot of typological variations. Figures in the paintings are heavy like the sculptures of western India. Cave excavation and painting were a simultaneous process and dating of the paintings follows the date of the cave excavation. Almost in all the finished excavations, pictures have been painted, but very few have survived. Various skin colours in the paintings represent multi-coloured society. The themes of the paintings are events from the life of Buddha, the Jatakas and Avadanas. Events happened in the jungle and events happened in the palace are separated by their locations. 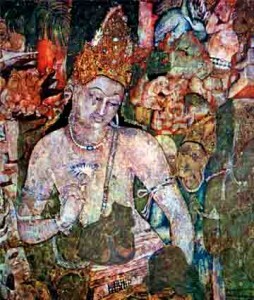 Images of Padmapani and Vajrapani are very common in Ajanta. It is a painting which dates back to the late first century CE. The Bodhisattva is holding a padma (Lotus) has large shoulders and has three bents in the body creating a movement in the picture space. The modelling is soft and the outlines are merged with the body volume, creating the effects of three-dimensionality. Light red, brown, green and blue colours are used in the picture. On the other side of the image, Vajrapani Bodhisattva has been painted. He holds a vajra in his right hand and wears a crown. Similar pictures can be seen in other caves too. 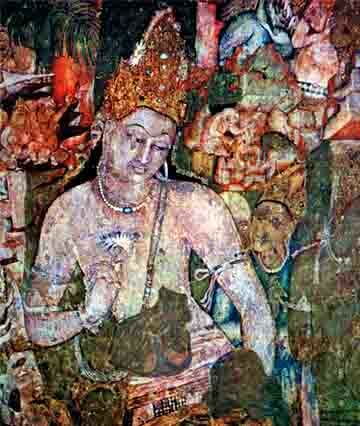 However pictures in cave no.1 are among the best survived paintings of Ajanta. The theme of Mara Vijaya has been painted in the caves of Ajanta, but only cave no.26 has a sculptural representation, sculpted on the right wall. The panel shows the image of the Buddha in the centre, surrounded by Mara’s army. The event is the part of enlightenment and Mara represents desire. It is the personification of mind which the Buddha went through at the time of enlightenment. 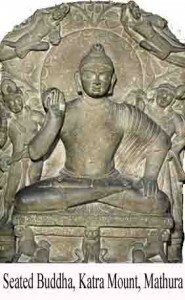 The Buddha is shown with his right hand indicating towards the earth as a witness to his generosity. The image of Mara is shown contemplating how to disturb Siddhartha, the name of Buddha before enlightenment. Another important cave site located in Aurangabad is Ellora. It is located 100kms away from Ajanta. There are 32 Buddhist, Brahamanical and Jain caves. It is unique art historic site in the country as it has monasteries associated with the three religions dating from fifth century CE onwards to eleventh century CE. It is also unique in terms of stylistic eclecticism, i.e., the confluence of many styles at one place. There are 12 Buddhist caves having many images belonging to Vajrayana Buddhism. Buddhist caves are big in size and are of a single, double and triple storey. The triple storey of Ellora is a unique one. Pillar designs grow from Buddhist caves and when they reach Jain caves (9th century CE), they become very ornate and the decorative forms gain heavy protrusion. Most of the caves of Brahamanical faith are dedicated to Shaivism. The different avatars of Vishnu are also depicted here. Cave no.16 is known as Kailas Leni/ kailasa temple. It is a rock cut temple which is carved out of a single rock. It was built in the 8th century CE. The grand sculpture of Ravana attempting to lift Mount Kailash, with his full might is a landmark in Indian art. Elephanta caves located on Elephanta Island near Mumbai were originally a Buddhist site which was later dominated by the shaivite faith. It is contemporary with Ellora. The other noteworthy cave site is Bagh located near Indore, MP. The Bagh cave also contains paintings and a painting which represents a group of dancers resembles the Garba Dance of North India (originated in Gujarat). The tradition of rock-cut cave continued in the Deccan and they are found not only in Maharashtra but also in Karnataka, mainly at Badami and Aihole, executed under the patronage of the Chalukyas; in Andhra Pradesh in the area of Vijayawada; and in Tamil Nadu, mainly at Mahabalipuram, under the patronage of the Pallavas. When the early history of the country depends on collective public patronage, the post sixth century CE depends more on political patronage. The sculpture of Maheshmurti (Shiva at centre and heads of Bhairava and Uma on either side) is located here. Like in western India, Buddhist caves have been excavated in eastern India, mainly in the coastal regions of Andhra Pradesh and Odisha. One of the main sites in Andhra Pradesh is Guntapalle in Eluru district. Guntapalle is among unique sites where the structural stupas, viharas and the caves are excavated at one place. Apart from Guntapalle, the other important site is Rampaerrampallam. In Ankapalli, near Vishakapattanam, a huge rock-cut stupa was carved out of the hillock during 4th-5th century CE. It is a unique site as it has the biggest rock cut stupas in the country. Another important cave site is the Udayagiri-Khandagiri caves located in Odisha. These caves are scattered and have inscriptions of Kaharvela Kings. According to the inscription, the caves were meant for Jain monks. There are numerous single cell excavations here. The upper part of the cell is decorated with a series of Chaitya arches and narratives that still continue in the folklores of the region. While construction of stupas continued, Brahmanical temples and images of gods also started getting constructed. Myths mentioned in the Puranas became part of narrative representation. Each temple had a principal image of god. Sarvatobhadra type: which can accessed from all sides. Some of the important temple sites of this period are Deogarh (UP), Eran, Nacha-kuthara and Udayagiri near Vidisha in MP, etc. These temples are simple structures consisting of a veranda, a hall and a shrine at the rear. good evening sir,i want public administration notes. Hi, am going through your NCERT culture series for a couple of days. It’s brief yet informative. Thanks for the service. The 4th point under seated buddha, katra mount, mathura title is incomplete. please make necessary changes. @Gouri: Thanks for pointing that out the missing word. It was Abhayamudra. We now updated the page. Thanks, this was extremely informative. But there’s a correction. Sandhara type temples have a pradakshinapath while Nirandara are those without a pradakshinapath. I confirmed it from unesco world Heritage site page as well. @Shruti: Updated. Thanks for pointing out.